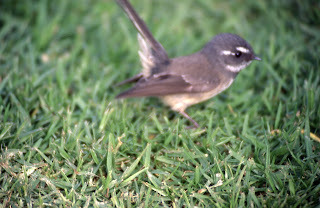 Recently some Victorian birders expressed surprise at seeing a Grey Fantail at sea. I think it was 5 or 6 kilometres from shore not far from Lakes Entrance. I have seen Grey Fantails in Bass Strait when I've been out on pelagics and I'm sure that they travel between Tasmania and the mainland. However, yesterday I was most surprised to see one in the very heart of Melbourne, in Bourke Street! That I had not expected to see. 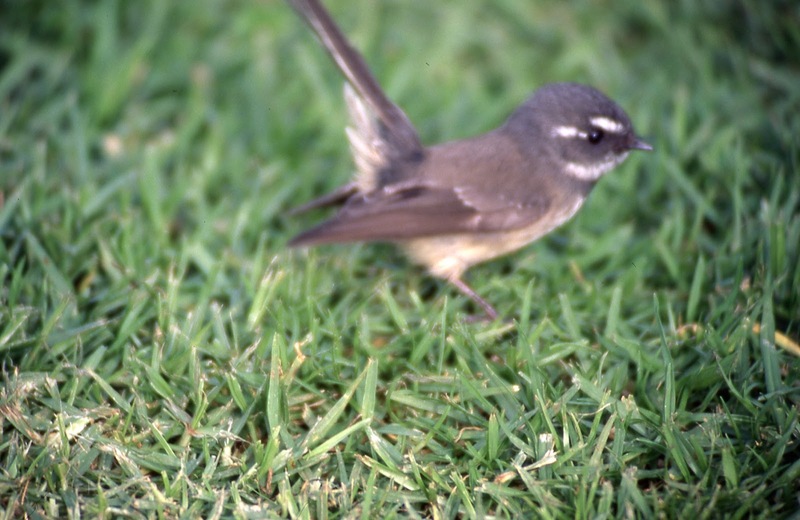 I don't have a photo of a Grey Fantail, but here's the very similar and much rarer, Norfolk Island Fantail. 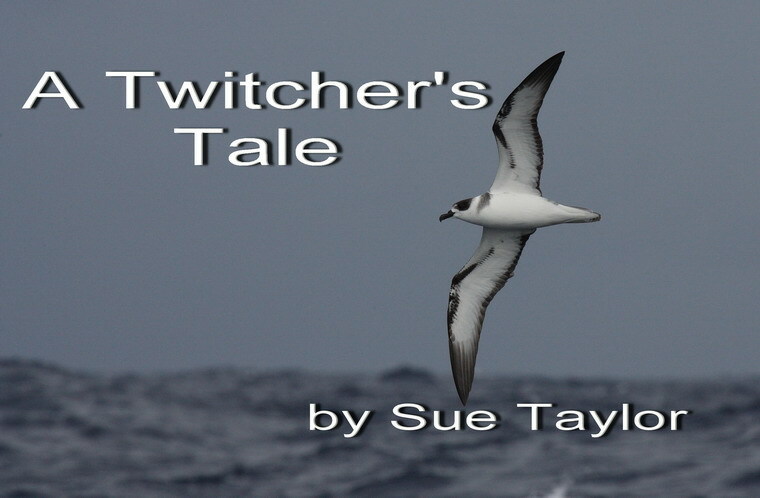 I am about to set off north, in the hope of seeing my jinx bird, the White-necked Petrel. I'm going to Port Stephens, and I hope the birds will perform for me. Keep your fingers crossed. This morning I was evicted from my own home by window cleaners. Every room I entered, there was a man with a ladder and a drop cloth. I couldn't possibly work in those conditions, so I decided to go birding. I went to Hay's Paddock. This is not far from Willsmere Park where I often go birding. There is a small lake, a couple of footy ovals surrounded by parkland and a very interesting adventure playground for children of all abilities, intellectually and physically. It's a while since I've been to Hay's Paddock and I found the reeds around the lake had grown enormously. The place was full of lorikeets and corellas. I had a lovely view of a Musk Lorikeet in a flowering eucalypt. All the usual suspects were on the water and I scanned the muddy banks for crakes. I've never seen a crake or a rail, or even a dotterel here, but the conditions seem ideal and I live in hope that I will one day. But perhaps I am wrong. Perhaps the conditions are not ideal. Hay's Paddock is a popular place for the locals to exercise their dogs, which is fine, if only they could control their pets. The first dog to attack me this morning was a border collie - one of my favourite dogs. He ran straight at me. I turned away, but this didn't put him off. He jumped up at me. I'm sure he meant no harm, but he was not welcome. He gaily ignored his owner yelling at him to leave me alone. The second dog to invade my personal space was a doberman. Poor thing had had his tail docked. What sort of a dog owner does that? He barked and was most intimidating. He jumped all over me. I don't suppose he had any intention other than making friends, but I found it a very frightening experience. He also happily ignored his owner's instructions. The third dog was a small brown curly haired bitser. I saw it coming and deliberately walked off the track into the bush, a long way out of his way. He was not to be put off. He ran to greet me and took much delight in jumping all over me. The thing about these unwelcome dogs is that not one of their extremely rude owners spoke to me. I didn't expect them to offer to pay for my dry cleaning, but I thought an apology was in order. It wouldn't have hurt them to ask if I was all right. I was never paranoid about dogs before I started going birding alone. It is absurd that I cannot walk freely in a local park without having dogs jump all over me. I was quite furious and cut my birding short and returned to my car. Who knows what birding delights I missed out on? Because of the window cleaners, I didn't think I could return home quite so soon, so I sat in my car and read my book. It is about Scott's expedition to the South Pole, using ponies. The chapter I read was about the unmanageable dogs pulling the sleds. A pony fell down in the snow, and the dogs immediately turned into an uncontrollable wolf pack, viciously attacking the fallen horse. Just what I felt like reading. If anyone reading this has any useful hints about how to avoid contact with dogs in the local park I'd be most grateful to hear them. 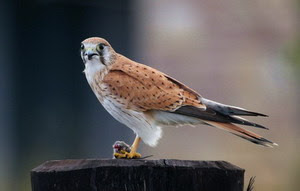 My nephew and I finally found a mutally convenient time to go birding and we met this morning at the Fairfield Boathouse. By 8 o'clock the fog was lifting, the lorikeets were squawking and it was turning into a lovely autumn day. We walked over the pipe bridge and along a narrow track beside the Yarra River, dodging joggers, dogs and cyclists.﻿ Grey Butcherbirds serenaded us and Willie Wagtails sang their pretty song. Not to be outdone, Red Wattlebirds filled the air with their raucous shouts, Noisy Miners mewed and always the ubiquitous Rainbow Lorikeets squawked. My nephew is a musician and I'm sure his ear will be very helpful with bird song identifcation. Red-rumped Parrots played quietly on the path in front of us and Long-billed Corellas played noisily high in a gum tree. Still the lorikeets squawked. We saw very few small birds this morning (in fact the only one was a White-browed Scrubwren) but we had managed 21 species when we stopped for coffee at the boathouse. An Australasian Darter flew overhead as we made our way back to the car park, giving us a total of 22 for the morning. We are lucky to have this wonderful bush so close to Melbourne. This morning I visited Seaford Swamp. I'd never been there before, so I consulted the Melways carefully. With my sense of direction, I knew I was bound to get lost. I'd been tempted to go there because Sean Dooley reported that there were Freckled Duck present. Admittedly, that was a couple of weeks ago, but I can hope. Freckled Duck often hang around for a while. The sky was grey and I feared it would rain, so I grabbed my waterproof jacket and threw it into the car. Of course I was right: I did get lost. Eventually I found the road and could see the swamp. However the parking area promised in the Melways simply did not exist. I pulled over to the side of the road and set off on foot, bravely leaving my jacket in the car. After a kilometre of admittedly very easy walking, I had a bird list of 19 species, but there was no sign of waterfowl or indeed a bird hide. The "swamp" appeared to be an empty paddock. I saw a gate with a couple of elderly codgers walking along a poorly defined track. I hurried after them through the stubble. They were charming and very helpful. They told me that the bird hide had been demolished, however, there was a viewing platform in Austin Road. They advised me to go back to my car and drive there. And so I did. When I reached the car, thanking the weather gods that it hadn't rained, the car was quite wet. It must have been a very localised shower. How lucky was that. I drove directly to the viewing platform, and from the base, admired teal, ducks, swans, coots and swamphens. Then I walked onto the elevated platform and saw, three beautiful Freckled Duck! I looked further and found three more. Not the numbers that Dooley had seen, but one will do to get onto my list. I was ridiculously pleased with myself. I'd got lost, and wasted over an hour walking along the wrong track, but I'd dodged the rain, and I'd seen my target species. That's a success in my language.